Within just half a minute of each other, two earthquakes shook the northern coastal region of the state. The first temblor, with a magnitude of 3.8, occurred at half past two early Sunday morning, October 26th. It was located off-shore, about 35 miles southwest of Eureka. With a magnitude of 4.9, the second quake was considerably stronger and happened virtually in the same spot (yellow dot on the map) 31 seconds later. The second quake was felt widely along the coast from Fort Bragg in the south almost to Crescent City in the north. The foci of both temblors are located within the "Mendocino Triple Junction," where three tectonic plates and several fault lines meet. Imagine a busy intersection with a three-way stop sign at rush hour. It takes only a few irresponsible drivers who don't want to wait their turn and traffic jams and accidents are likely to occur. Something very similar is happening every day in the Earth's crust under Cape Mendocino. There upheaval is caused not by impatient drivers but by tectonic plates, which are crashing into each other with unstoppable momentum. This tectonic three-way intersection is called the Mendocino Triple Junction. It is one of the few places in the world where three of the gigantic plates which continuously drift on the Earth's mantle meet. Along the length of most of California, the San Andreas Fault defines the boundary between the Pacific Plate to the west and the North American Plate to the east. Along the fault line, the Pacific Plate slides horizontally in a northnorthwesterly direction with respect to North America (see blog October 17, 2008). Under Cape Mendocino, this trip comes to an abrupt halt, because another plate gets in the way. North of the Cape the off-shore Gorda Plate, a small cousin of the Pacific Plate, glides under the North American Plate in what is called a subduction zone. 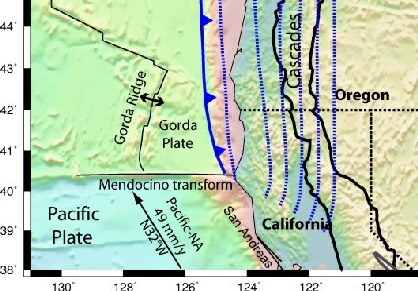 The boundary line between the Pacific Plate and the Gorda Plate is a fault similar to the San Andreas, called variably the Mendocino Transform or the Mendocino Fracture Zone. It goes from Cape Mendocino for several hundred miles due west into the Pacific Ocean. Along this fault, the Gorda Plate slides horizontally to the east with respect to the Pacific Plate with a speed of about 2 inches per year. Because of the different directions and the various rates of movement of the three plates, the area under Cape Mendocino and a region immediately off-shore has to absorb a lot of mechanical strain. That makes this area one of the most seismically active regions in the state. During the last three decades alone, two strong earthquakes with magnitudes above 7 have occurred there, one in 1980 and the other one in 1994. Every year at least 80 temblors with magnitudes over three are recorded in this region, like the earthquake duo which shook the area early on Sunday morning.